Lloyd Bettney, 16, and Jordan Geraghty, 21, who work with the Designs team. Signage and vehicle branding company Designs is celebrating their young talent during National Apprenticeship Week. 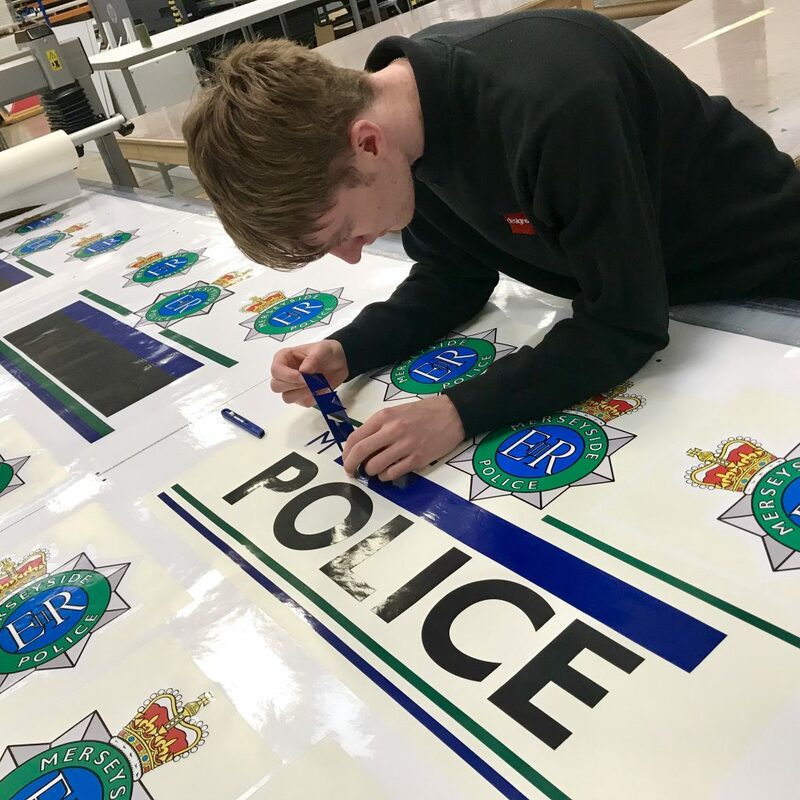 Offering apprenticeships to people aged 16+, Designs currently employ two apprentices; Lloyd Bettney, 16, and Jordan Geraghty, 21, who work with the team four days a week alongside their studies to learn the tricks of the trade in order to go on to work in the signage industry. 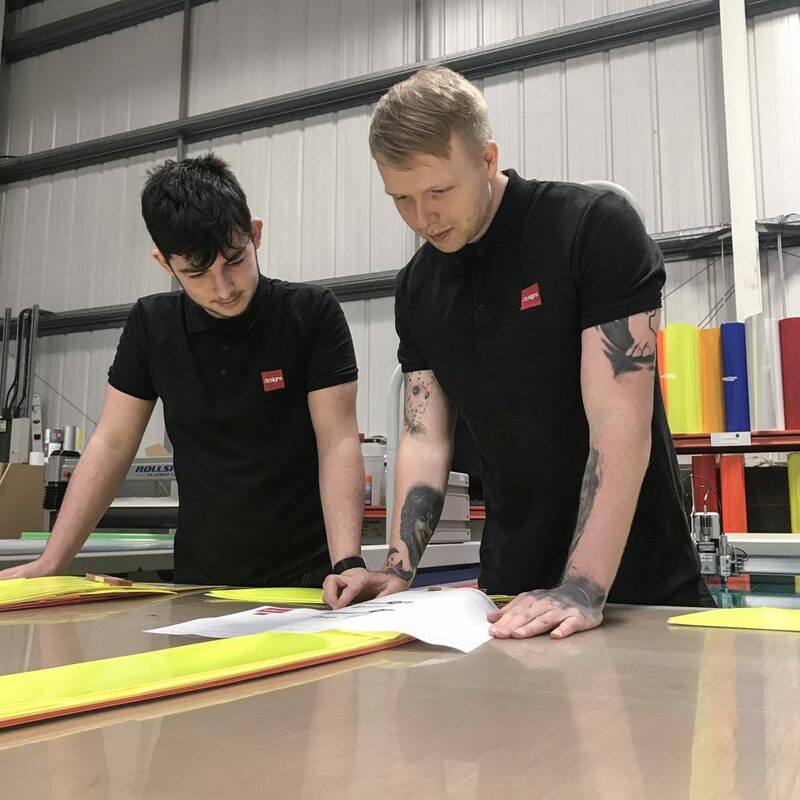 Working as vinyl print operatives, both are key assets within the team, and are fully trained to run the various print and cutting machines needed to create signs and branding for Designs’ customers. They also are competent in assembling vehicle reflective kits that Designs supply for the Emergency Services. Apprenticeships give young people the chance to train while they work, gaining hands-on experience and a salary at the same time. Taking between one and six years to complete, they are available to people over 16, during which they will be trained to be fully proficient in their chosen occupation. Lloyd Bettney said of his apprenticeship: “The team has really supported in my role here at Designs. I’m on a year course, and at the end I’ll gain my level two in sign making, and also have experience in the industry which is so important. Jordan Geraghty said: “After applying for the course online, Hull College referred me to Designs. What’s great is that I’m working with a team that have years of experience, and everyone there has helped me to understand my role fully. Assembling vehicle reflective kits that Designs supply for the Emergency Services. “Rob Daysley, managing director at Designs, said: “Lloyd and Jordan are crucial team members here at Designs. From day one we’ve taken them in with open arms, and the tasks they complete really contribute to our workload. Coordinated by the National Apprenticeship Service, National Apprenticeship Week is an annual celebration of apprenticeships that brings the community together to celebrate their impact on individuals, employers and the wider economy. Designs are one of the UK’s leading signage and branding companies. Starting from a sole trader, it is now a recognised brand in the industry. Investing in the latest technology and equipment to meet their clients demand for quality products, they have expanded the business’s large format print department, which has enabled them to win larger commercial and retail contracts nationwide. For more information on Designs visit: www.designs.uk.net. Be the first to comment on "Designs celebrate young talent during National Apprenticeship Week"